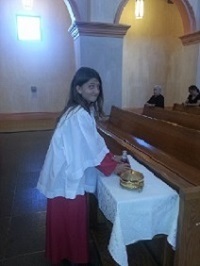 DO YOU WANT TO BECOME AN ALTAR SERVER? CLASSES BEGIN THURSDAY OCTOBER 10TH AT 5:00PM IN THE CHURCH!! THIS IS THE PERFECT OPPORTUNITY FOR YOU TO PARTICIPATE FULLY IN THE MASS AND BELONG TO A GREAT ORGANIZATION OF KIDS YOUR AGE! 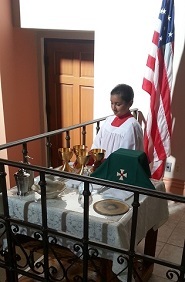 THERE ARE MANY THINGS TO DO AS A SERVER: CROSS BEARER - CANDLE BEARER - BELL RINGER - BOOK BEARER; YOU HELP SET THE GIFTS TABLE AND THE CREDENCE TABLE; AND PROVIDE A GREAT EXAMPLE FOR THE YOUTH OF YOUR PARISH. MASTERS guide the priest through the Mass. They can't start studying until they've served a minimum of 6 months and are 12 and a half years old. They have to learn the order of the Mass and the names and locations of all the things that are used at a Mass. If a mistake happens when a Master is serving he's responsible for it no matter who makes it. If they continue on after graduation they become "senior masters" and wear a yoke that matches their surplice. SENIOR SERVERS are responsible for the Sanctus Candle which gives emphasis to the real presence of Jesus at Mass. To become a senior server a girl must have served for at least 6 months and be at least 12 and a half years old. When there's no master, the senior server is responsible for guiding the servers and takes care of the book for the priest. To become a senior server a girl has to know the names and locations of all the things used at Mass. She also has to be able to time her walk from the front door to the altar so it coincides with the Holy Holy Holy and will end when that prayer ends. The Masters' program brings a boy close to the altar in hopes he'll feel called to the priesthood. The Senior Server's program gives a girl experience walking down the aisle (which whether she becomes a bride or a religious will benefit her) and provides an opportunity to participate fully in the Mass. Interested in becoming an Altar Server or Master? 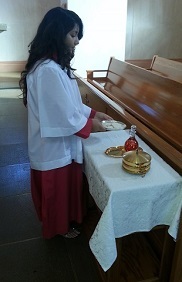 Being an Altar Server allows you to actively particpate in the Mass and be an example to all our Parish Youth!! BE SURE TO CHECK OUT YOUR PICTURES IN THE PHOTO ALBUM OF THIS SUMMERS "SERVER'S SWIM" HOSTED BY FR. PETER AND THE STEWARDSHIP COMMITTEE!! !